Meghan Markle is celebrating her 37th birthday today, her first birthday as a member of the British Royal family. To mark the occasion, all of the Royal family’s social media accounts posted tributes to the Duchess of Sussex. The official Royal Family Instagram account, which represents Queen Elizabeth II and Prince Philip, also posted a sweet snap of Meghan and the Queen giggling at an event. Clarence House, which represents Meghan’s parents-in-law Prince Charles and the Duchess of Cornwall Camilla, also shared a sweet tribute. 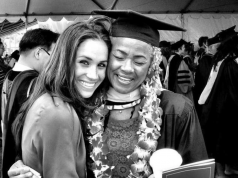 Their tributes on social media are particularly poignant during a difficult time for Meghan, as her family continues to speak badly about her in the press. Meghan spent her birthday at the wedding of Prince Harry’s good friend Charlie van Straubenzee today.